I'm not a toy collector in any way. But I have a major soft spot for Mego from when I was a kid. I could see myself springing for the Star Trek and the Dracula. And probably an Action Jackson since I got one from my Aunt and Uncle when I was a wee one. My problem is that I'm going to want to take them out of the box and mess around with them. I'm sorry I'm replying to this so late, but I wanted to warn you. I had a terrible, Kick the Can moment when I got my hands on a MEGO (Green Goblin) as an adult some fifteen years ago now. The problem was that my giant, grown-up hands no longer fit easily and comfortably around the figure. Instead, the fit was clumsy and awkward, the toy seeming to twist and wrest itself away from my grasp, repulsed by my ugly, exaggerated proportions. It broke my heart. I still love them, and collect them infrequently, but I don't touch them, preferring them mint on the card. Here's hoping you have a better experience. Well Target online had some of them available at midnight PST, and I ordered 3-14 inch Wonder Woman, 14 inch Zod, and 8 inch Jimi Hendrix. The 14 inch Batmanand Harley read as sold out and the Bela Lugosi Dracula never got listed on the site, and those were the other three I was in the market for. i will likely take a drive out to Target tomorrow to see what I can turn up. Disappointed with the roll out of these figures. None of the figures are available at any Target near me. Also disappointed that the ones I wanted are no longer listed on their website. I've been seeing them for sale for very unreasonable prices on Ebay. Had an adventure at Target this morning, but did end up getting Batman and Harley. The Targets near here don't have stock crews on Sundays, so everything was still in the stock room and clerks were trying to find things for customers who came in, but the Target exclusive Pokemon Funko Pops also released today and those were in high demand so the clerks were clearly overwhelmed and the stores not prepared for a Sunday debut of 2 major product lines in their toys/collectibles sections. No way would I buy one from an ebay scalper. I did check Target.com this morning and was able to order Wonder Woman. Harley Quinn was available as well. I did see that Marty Abrams had a video on the Mego Ambassador page advising that all Targets should have the figures in 10 days or so. Also saw that the Batman neck issue has been corrected for the second wave of characters. You have to hunt the Target stores. Certain area's order heavily and others ignore. I have seen most if not all of the figures through various stores in my area. There are going to be elusive ones to find though as lots of "collector/investors" are buying up all the product they can find. Seen it myself in one store this weekend where a guy was buying up "every" figure in the store: duplicates and all for resale on Ebay. 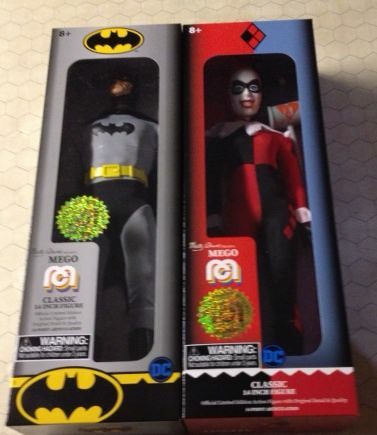 Had a friend text me Sunday that there was a line of 12 folks waiting at the Target near his home to open and they all rushed in to grab up any Mego's they could get. My buddy got me the only Mego I cared about: Dracula. 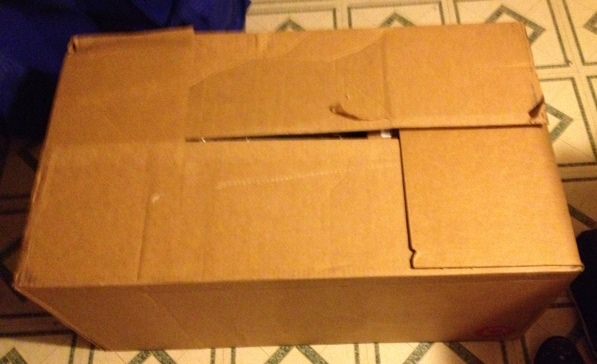 I have seen only 1 Star Trek Mirror Universe and the box was mangled to death. The Batman neck issue is an easy fix for display if you take it out of the box. Bulk up the cape on the shoulders using cotton balls to give him broader shoulders and the neck looks fine. Target is doing a massive overhaul of it's toy department and it's collectibles section in electronics in prep for the holiday season so a lot of the Mego deliveries are still sitting int he stock rooms at some targets while they do the work on that. 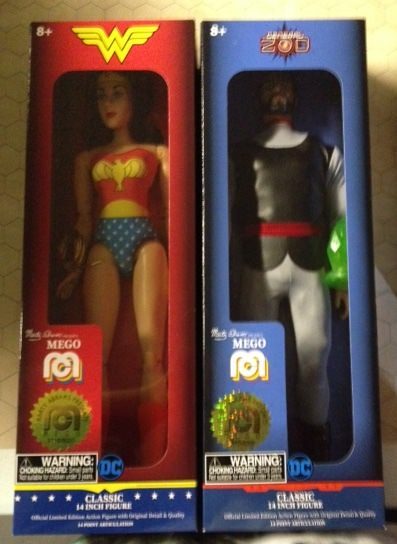 the only Mego i wanted I haven;t found yet in the first wave is Dracula. Mego The Brady Bunch Greg Brady Action Figure 8"
Mego The Brady Bunch Marcia Brady Action Figure 8"
Mego Charmed Phoebe Action Figure 8"
Mego Charmed Piper Action Figure 8"
Mego Charmed Paige Action Figure 8"
Mego Charlies Angels Kris Munroe Action Figure 8"
Mego Charlies Angels Sabrina Action Figure 8"
Mego Happy Days Richie Cunningham Action Figure 8"
Mego Happy Days Pinkie Tuscadero Action Figure 8"
Mego KISS Paul Stanley Action Figure 8"
Mego KISS Gene Simmons Action Figure 8"
Mego Facts of Life Tootie Action Figure 8"
Mego Cheers Woody Boyd Action Figure 8"
Mego Cheers Cliff Calvin Action Figure 8"
Mego Cheers Norm Petterson Action Figure 8"
Mego Married With Children Peg Bundy Action Figure 8"
Mego Married with Children Kelly Bundy Action Figure 8"
Mego Married with Children Al Bundy Action Figure 8"
Mego Classic Superman Action Figure 14"
Mego Lex Luthor Action Figure 14"
Mego Black Batman Action Figure 14"
Mego Green Lantern Action Figure 14"
Mego The Flash Action Figure 14"
Mego Poison Ivy Action Figure 14"
Mego Joker Action Figure 14"
I've been to my Target more this week than in the last 10 years, haha! Still no Megos or any sign of them. I asked two of the workers if they knew when they may getting them and I got conflicting stories from this store isn't selling them to they are online only to the toy department is undergoing a major reset and if they are going to be sold at this Target it would be sometime in the next few weeks. I'm going on an adventure this weekend to some nearby Targets and see if my luck is any better. you can also enter the codes at Brickseek to see if they are available at your local Target before heading out (it works for other retailers too, you have to tell it what retailer and what your zip code is to get the results you want. 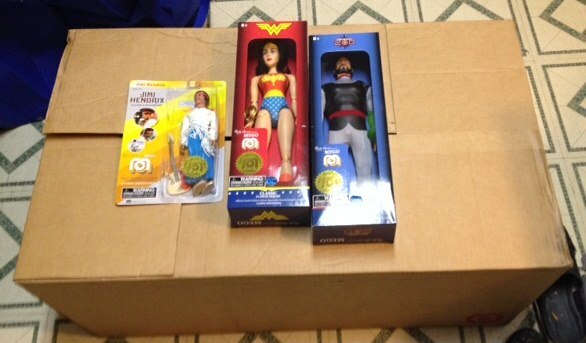 and I am expecting Jimi Hendrix, Wonder Woman and General Zod to arrive tomorrow or Tuesday. The Wonder Woman I ordered from target.com arrived Saturday and she's really cool. I went to a Target that is about a hour and a half away and found all the Megos. I got Batman, Zod, I Dream of Jeannie, and Tootie. My buddy picked up a Batman as well and we had a good laugh about how we are adults freaking out in a crowded Target store over action figures, haha! Looks like Dracula and Tootie are now available online at Target.com as well. seriously, wtf? 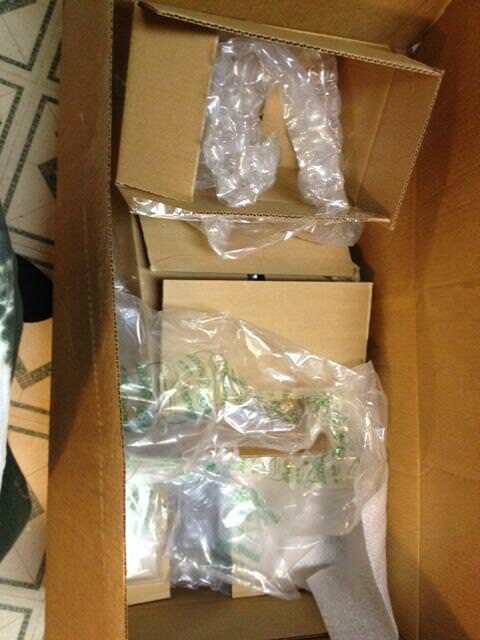 I am glad I qualified for free shipping but that is such a waste of material. my only complaint is the guitar itself, it's a left hand guitar and Jimi played a right hand guitar upside down left handed, not a lefty guitar, and it has no guitar strap to use when displaying the figure. at some point I might want to get the other Trek figures from this wave (Chekov and the Mirror Mirror Kirk/Spock 2 pack), but I got all the must haves from the wave now. Some of the other female figs (Piper, Kelly Garrett) might be good for custom fodder too. I got more Megos today. Dracula is so awesome! Kelly Garrett didn’t have the gold numbered sticker and I had to open her card to fix her legs (they were facing the wrong way). 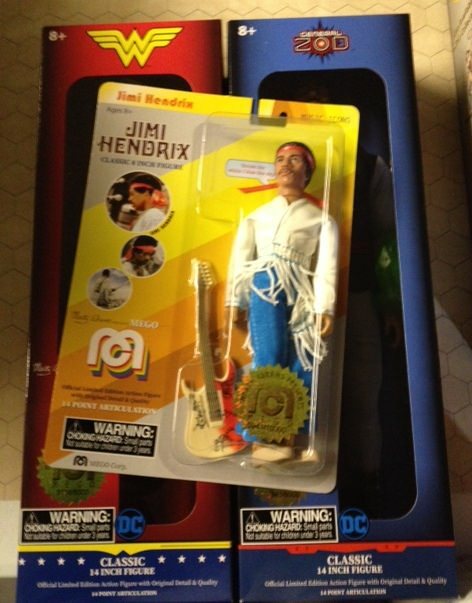 Jimi Hendrix and Fonzie arrived as well. I haven’t had so much fun in years. Mego coming back has brought back so many happy memories. Stopped by the Target in Twin Falls when I made a Costco run. 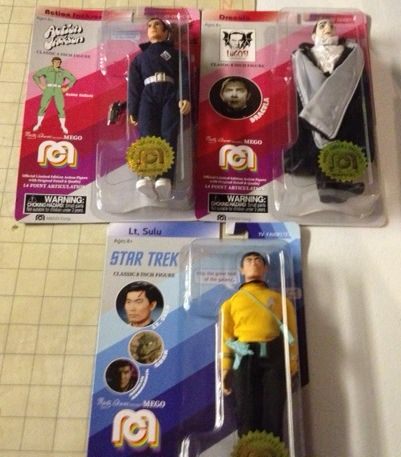 I picked up the Dracula and the Sulu figures. They had Chekov, Action Jackson and the Kirk/Spock set, but I couldn't justify the expense for all of them. I'll run back up there in a couple weeks and see if they have anything left, but they had a pretty good cross-section of the figures so far.